Back for another season and growing stronger, Art Hearts Fashion held their LAFW Kickoff Party at Station (W Hollywood). The event gave fashion aficionados an opportunity to mingle and chat with the designers. Betty’s fabulous hair piece caught my attention. She informed me that she creates couture hair designs for What A Betty and they would be worn by the model’s in Isabella Couture’s kidswear showcase. The next night everyone gathered at Taglyan Complex for Sue Wong’s fashion show, which was the first of many of Art Heart Fashion’s LAFW events. A majority of those in attendance were decked out in Sue’s creations, which were easy to spot due to their intricate attention to detail. A number of celebrities walked the red carpet. Inside I spotted Nikki Sixx (Motley Crüe). Kate Linder (The Young and the Restless). 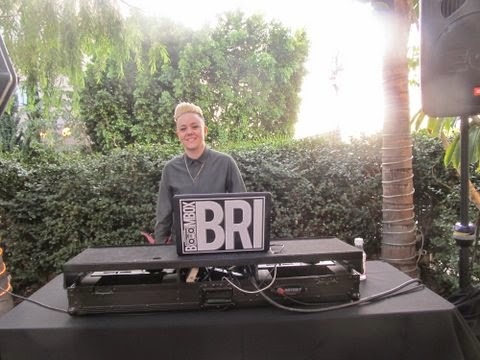 And, BoOmBoxBri. Who is the best damn DJ in L.A. This girl knows how to rock it! Sue Wong’s exquisitely detailed FW15 collection—titled Mythos and Goddesses—paid homage to the her patron goddesses – Aphrodite, Artemis, and Athena. The embroidered and crystal embellished gowns were regal works of art that brought a whole new level of glamour and sophistication to the runway. The designer’s mantra is: beauty, magic, and transformation, which was represented in this seductive and sensual collection that featured 76 looks. To further emphasize the mystique models wore elaborate headpieces designed by Wong, Kicka Custom Design, Lisa Marinucci Design, and Studio Art Metal Shop.